Ananas. 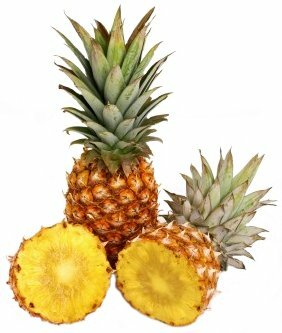 (From nana, the Tupi Indian word for the fruit of Ananas comosus.) PINEAPPLE. Bromeliaceae. Eight species of stemless or, rarely, short-stemmed, terrestrial, perennial herbs, to 3m in flower. Leaves slender, rigid, linear-acuminate to lanceolate, grey-green, coarse above, rough, scaly beneath, in dense basal rosettes of 50 or more, usually spinose. Inflorescence terminal; scape slender, bracteate; floral bracts to 2cm, persistent, yellow, red-green or purple, with spiny margins; sepals 6-7mm, ovate, acute, free to top of ovary; petals 7-17mm, white, violet or purple, tongue-shaped and free; stamens much shorter than petals. Fruit a fleshy, long, ovoid syncarp of 100-200 fused, berry-like fruits, bearing a terminal crown (coma) of loosely arranged leafy bracts to 15cm long with spiny margins. Offsets may be produced at the base of the coma. S America. Z10. Grown as stately foliage plants or economic curiosities in the intermediate greenhouse, the conservatory or home. The variegated forms of Ananas bracteatus and Ananas comosus are especially striking. Provide a minimum temperature of 13-15ºC, high humidity and good light conditions. Variegated cultivars of Ananas comosus. are particularly intolerant of any draught. 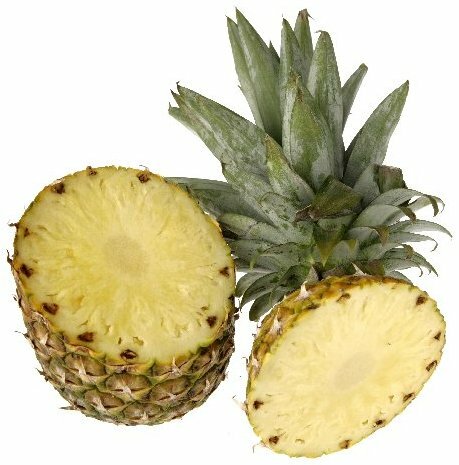 Ananas comosus will usually only fruit at about three years old; even in large pots, containerised plants make smaller fruits. For good fruiting, give a winter rest at 13-15ºC with reduced watering, a summer minimum of 16-20ºC. Bottom heat throughout growth is beneficial. Grow in strong, direct light, shading slightly only in the hottest days of summer. Provide draught-free, fairly humid conditions, watering plentifully when potting medium is nearly dry. Syringe once or twice daily with warm water in hot weather, damp down and ventilate carefully (avoiding draughts), when temperatures rise above 25ºC. Pot on in spring. Liquid feed when fruits begin to swell and reduce watering/humidity: cut just before completely ripe. New plants are usually produced by rooting large (about 45cm) offsets in late spring. Propagate also by detaching the ‘crown’ (foliage above the mature fruit), allowing the cut area to dry slightly before potting. Also by stem cuttings after fruiting: remove leaves from stems and cut into pieces or lay intact in trays, covering with 2cm of rooting medium. Place all propagules in a closed propagating case and give bottom heat of 20-27ºC. Propagation from seed is usually worthwhile only for the commercial production of new varieties. Susceptible to mealy bug and brown scale: treat by sponging with warm water. Plants affected with white scale should be removed and burned. Over 1m in flower. Leaves to 1m x 2.5cm, recurving, in a loose, spreading rosette, margins with dense, upward-pointing spines, surfaces with tiny white scales. Inflorescence many-flowered, 15cm long, scape slender; floral bracts serrulate; flowers red-purple; sepals 7mm; petals 7mm. Fruit inedible, to 20cm. Brasil. RED PINEAPPLE; WILD PINEAPPLE. Similar to Ananas comosus. Leaves in a loose basal rosette, spiny, acuminate, green-brown, leathery. Inflorescence 15cm, showy, borne on a short, stout scape; flowers red to lilac-purple; red-green floral bracts cover the tops of the ovaries in fruit. Fruit green-brown, seedy but edible; coma coriaceous. Late spring. variety tricolor. Leaves brown-cream, with creamy yellow lines parallel to the veins and red marginal spines. Leaves to 1m x 4cm, 30-50 in dense rosettes, deep green to grey-green to red, pungent, margins spinose. Inflorescence ovoid-conical, 20-30cm; scape bracteate, to 50cm; flowers violet-red; floral bracts yellow-red, united to ovaries. Fruit a seedless, juicy syncarp to 30cm, crowned with 20-30 leafy bracts. Late spring-summer. Brasil. 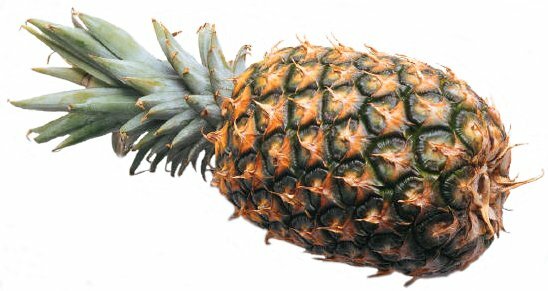 Vegetatively propagated by rooting the coma, Ananas comosus is a seedless cultigen of unknown ancestry. The most important of the many cultivars are ‘Hawaiian King’: large, smooth-leaved; ‘Honey Gold’; very large, fruit to 7kg; ‘Smooth Cayenne’: spineless, grown in Hawaii; ‘Queen’: spiny, used in Malaysia and Kenya; ‘Red Spanish’: used in West Indies. ‘Porteanus’: leaves with central yellow stripe. ‘Variegatus’: leaves variegated with longitudinal, yellow stripes, sometimes marked red. Leaves to 1m x 3.5cm, subentire, pungent, forming a robust, erect rosette. Inflorescence to 20cm, bracteate, branches at base and apex; scape slender; flowers white or lilac; sepals broadly ovate, to 7mm; petals to 17mm. Fruit inedible. Venezuela, Peru, Brasil. Leaves deep green, leathery, 45-60cm, recurved, margins spiny, spines pointing upwards. Inflorescence few-flowered, to 10cm; flowers lilac-purple or red; sepals 6mm; petals to 15mm. Fruit to 15cm; seeds rarely formed; coma 10-15cm high. Brasil, Surinam.